2851. “Willis Adolph Noren,” Find-A-Grave, https://www.findagrave.com/memorial/1037507, 1037507. 2853. Ronald Cameron Larson, http://www.geni.com/people/David-Larson/6000000013470613730, September 10, 2016. 2854. “Bert B Larson,” Find-A-Grave, https://www.findagrave.com/memorial/105437139, 105437139. 2855. “Chelta M Foster Larson,” Find-A-Grave, https://www.findagrave.com/memorial/105437140, 105437140. 2856. “David Leonard Larson,” Find-A-Grave, https://www.findagrave.com/memorial/137253997, 137253997. 2857. “T Isabel Larson,” Find-A-Grave, https://www.findagrave.com/memorial/137255537, 137255537. 2859. “Obituary | Condolences,” Daniel Yager, Longmont Times-Call, Longmont, Boulder County, CO, USA, December 2, 2012. Daniel Lee Yager, 55, of Longmont passed away November 29, 2012 at his home. He was born March 3, 1957 in Golden, Colorado to Norman and Joanne (Holmdahl) Yager. He graduated from Longmont High School. Daniel married Julia Hart September 2, 2000. Daniel worked for Lexmark of Boulder, he was a Boy Scout leader and enjoyed steam engine trains, fishing, driving and exploring the mountains and the countryside. He was preceded in death by his father Norman. Daniel is survived by his wife Julia, two sons Erick and Cody Yager, two daughters Veronica (Roni) and Brandy Yager, his mother Joanne Yager, a brother Randy Yager and a sister Becky Knope and her husband Mike. 2862. “Marshall Douglas Bird,” Find-A-Grave, https://www.findagrave.com/memorial/74842735, 74842735. 2864. Clyde Dwight Crenshaw and Robbie Harrison, “North Carolina, County Marriages, 1762-1979,” May 14, 1944, Pasquotank, NC, USA, GS Film Number: 000260216 , Digital Folder Number: 005354906 , Image Number: 01048, https://familysearch.org/ark:/61903/1:1:QJ81-QZ2D. 2868. 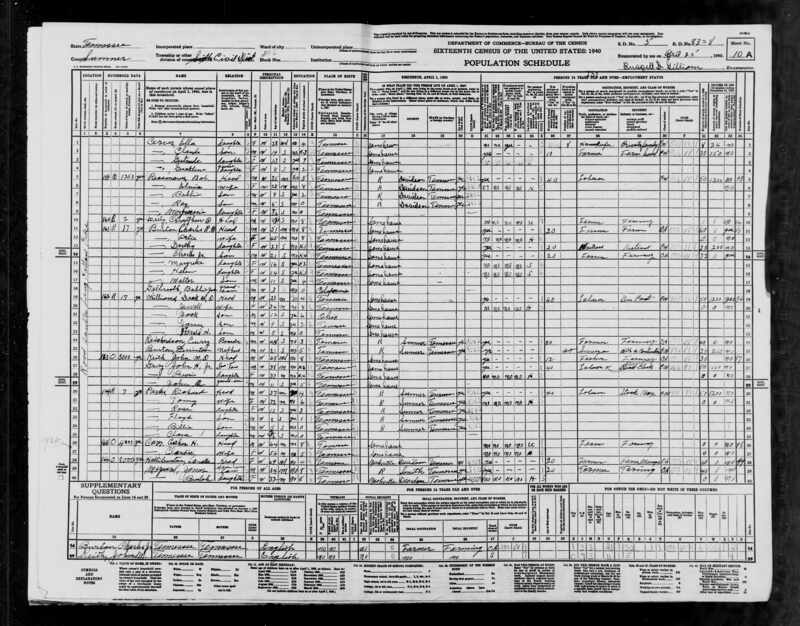 Clyde D Crenshaw, “Texas, Death Index, 1964-1998,” November 1, 1987, Victoria County, TX, USA, https://familysearch.org/ark:/61903/1:1:JVTV-NQ3. 2870. Arthur Boyd Voyce, “Iowa, County Births, 1880-1935,” July 16, 1906, Hamilton, Grove County, IA, USA, https://familysearch.org/ark:/61903/1:1:KHTD-GX1. 2871. “Arthur B Voyce,” Find-A-Grave, https://www.findagrave.com/memorial/126460018, 126460018. 2876. “Jimmy H Anderson,” Find-A-Grave, https://www.findagrave.com/memorial/113685137, 113685137. 2878. “United States Census: 1940,” Bureau of the Census, US Dept. of Commerce, United States of America, 1940, TN, Sumner County, District 06, April 25, 1940, Russel D Gilliam, 10A, 5, 83-8, T627, 5461381, 318. 2879. “Dock W Williams,” Find-A-Grave, https://www.findagrave.com/memorial/125131965, 125131965. 2880. “Jewell B Williams,” Find-A-Grave, https://www.findagrave.com/memorial/125131997, 125131997. 2881. “Harold Boyce “H.B.” Williams,” Find-A-Grave, https://www.findagrave.com/memorial/125056855, 125056855. 2882. Harold B. Williams age 75 of Cottontown passed away Thursday April 22, 2010 at Alive Hospice @ Skyline Madison.Remains are at Austin & Bell Funeral Home, White House where services will be conducted 2pm Sunday April 25, 2010 with Bro. Scott Ballard officiating. Interment will follow at Hillcrest Cemetery. Visitation with family will be Saturday 2 to 8pm and Sunday 12 to 2pm at the funeral home. Mr. Williams was born December 12, 1934 in Nashville, Tennessee. Mr. Williams was a member of Old Hickory Credit Union Board for 22 years and was twice chairman of Sumner County Board of Education for 22 years. He was with the White House High School football film crew for 42 years. H.B. Williams Elementary School was named in his honor. Preceded in death by parents, Dock W. & Jewell Burton Williams and brothers, Jack and Jim Anderson. Survived by wife of 50 years, Josette Williams; son, Keith (Tara) Williams of Cottontown; daughters, Libby (Ian) MacNeilly of Kingsburg,CA and Susan (John) Lees of Cottontown; 11 grandchildren. Pallbearers J. T. Womack, Richard Lees, John Lees, Ian MacNeilly, Keith Williams, Jim Smith. Honorary pallbearers, Tommy Hampton, Mark Lees, Ray Williams, Michael VonFlue, David VonFlue, Andrew MacNeilly, Daley Smith, Kate Womack, Rachael Williams. 2883. “Jeremiah Brown,” Find-A-Grave, https://www.findagrave.com/memorial/19929899, 19929899. 2884. “Nancy Hodges Brown,” Find-A-Grave, https://www.findagrave.com/memorial/19929897, 19929897. 2885. “Aaron B Hodges,” Find-A-Grave, https://www.findagrave.com/memorial/136359219, 136359219. 2886. “Elizabeth Frances Hodges,” Find-A-Grave, https://www.findagrave.com/memorial/136359252, 136359252. 2887. “Lucinda C Brown Brizendine,” Find-A-Grave, https://www.findagrave.com/memorial/53114538, 53114538. 2888. “James Wright Brizendine,” Find-A-Grave, https://www.findagrave.com/memorial/53114428, 53114428. 2889. “Vincent Markham Brown,” Find-A-Grave, https://www.findagrave.com/memorial/136368719, 136368719. 2890. “Savira Elvira “Puss” Bradley Brown,” Find-A-Grave, https://www.findagrave.com/memorial/136368761, 136368761. 2891. “Hiram Brown,” Find-A-Grave, https://www.findagrave.com/memorial/116889517, 116889517. 2892. “Penelope Elizabeth “Penny” Moye Brown,” Find-A-Grave, https://www.findagrave.com/memorial/119459489, 119459489. 2893. “Irene M Adeline Brown Ausbrooks,” Find-A-Grave, https://www.findagrave.com/memorial/136359106, 136359106. 2894. “William Clay “Buck” Ausbrooks,” Find-A-Grave, https://www.findagrave.com/memorial/19929946, 19929946. 2895. “George Washington Brown,” Find-A-Grave, https://www.findagrave.com/memorial/19929730, 19929730. 2896. “Sarah R A “Sallie” Brizendine Brown,” Find-A-Grave, https://www.findagrave.com/memorial/59580754, 59580754. 2897. Myra Jean Harvey Adams, “Adams-Harvey Families,” http://worldconnect.rootsweb.ancestry.com/cgi-bin/...mjadams&id=I7202, November 24, 2006. 2898. Jeremiah Brown and Nancy Hodges, “Tennessee, State Marriage Index, 1780-2002,” March 13, 1821, Sumner County, TN, https://familysearch.org/ark:/61903/1:1:VNCQ-7FS. 2899. “Obituary,” David “Sprocket” Aubrey Archibald. ARCHIBALD ~ David Aubrey "Sprocket" Archibald passed away at the Lloydminster Hospital on Tuesday, April 1, 2014 at the age of seventy-five years. Dave was born in Upper Musquodoboit, Nova Scotia on August 27, 1938 to Georgetta and David Archibald. Dave leaves to mourn his passing, his loving wife, Kay; daughter, Michelle (Richard) Duncan; son, Trevor (Jackie) Archibald; four grandchildren, Aubrie and Kaylee Duncan and Owen and Lucas Archibald; sister, Geraldine (Louie) Horvath and numerous other relatives. Dave was predeceased by his parents and a sister, Shirley (Wiss) Fleming. The Memorial Service for Dave was conducted from the Lloydminster Exhibition Prairie Room, Lloydminster, Saskatchewan on Saturday, April 5, 2014 at 1:00 P.M. with Pastor John Haycock officiating. McCaw Funeral Service Ltd., of Lloydminster, Alberta administered the funeral arrangements. The family of Dave Archibald would like to thank everyone for the phone calls, visits and emails throughout his journey with cancer. Thanks also for all expressions of sympathy sent to the family. In lieu of thank you notes, the family wishes to make a donation to the Lloydminster Palliative Care at the Lloydminster Hospital. 2900. “Obituary,” Robert “Bob” Stanley Purdy Sr.
Robert Stanley Purdy Sr. passed away on Feb 14, 2010 at the RDRHC at the age of 59. He is predeceased by his father Melville Purdy on Aug. 10, 1990 and his grandson Jakob Harvey on Feb. 27, 1996. He is survived by his mother Elizabeth (Betty) Purdy, his spouse Caroline (Rose) Mammel. His sister Joan (Don) Armstrong and brother Doug (Shirley) Purdy. His children Chalane, Tarene, Stan and Lyle. Also his numerous grandchildren, nieces, nephews, extended family and friends. There will be a luncheon to celebrate his life at the Penhold Memorial Hall, 1123 Flemming Ave, Penhold, AB. on Friday, February 19, 2010 from 2-4pm. We would like to thank the nursing staff on unit 33 for their devoted care and attention. In lieu of flowers, memorial donations may be made to the Organ Donation and Transplant Association of Canada, 444 Ontario St., Stratford, ON N5A 3J2.